Our Cape Town-Krakow transfer was by no means a direct route. We started with two full days of driving across Africa to Johannesburg, followed by a redeye to London Heathrow, and twelve hours later we flew out of Stansted to Krakow with our old nemesis, Ryan Air. The high point was spending our London layover with our friend Evan who was in town visiting his family for the holidays. 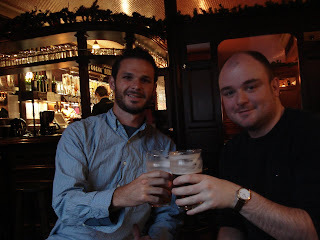 We got the real Londoner tour this time, starting with a freshly cooked full English breakfast at Evan's Notting Hill home, which incidentally is a historical monument, followed by a visit to the Rosetta Stone at the British Museum, finished off with pub crawling among surly old regulars who showed us that there's nothing wrong with drinking a pint (or two or three) at 11am on a Tuesday. We finally arrived in Krakow after dark, fairly delirious, and somehow managed to make our way into town and bed. It was only the next morning that we started to take everything in. We found ourselves in Sodispar's cozy "Florence" apartment with soaring ceilings, fully outfitted kitchen, and tasteful decor by IKEA. One block away was the old town square looking like it belonged in a snowglobe: cobblestones, Christmas Market, and towering St. Mary's Church all covered in white dust. To say Krakow is charming is like calling Tom Brady attractive--a gross understatement. We were cast under its spell immediately. St. Mary's is the oldest gothic church in Europe and we had a vigorous debate going about whether its gluttonously gilded and stainglassed interior w as more or less impressive than its towering presence on the square. The place is shrouded in tradition: every day at 11:50 sharp is the ceremonial opening of the famed wooden altar and a bugler predictably plays from the tallest tower to herald the changing of every hour. It's hard for the multitude of other cathedrals to compete, but many attempted by offering classical music concerts in the evenings like the one we attended at St. Peter and Paul's. Nothing in town is very far. We experienced the Krakovian tradition of "Christmas cribs" with an exhibit on the square, explored the old Jewish quarter, visited Oskar Schindler's factory, and wandered through the stately state rooms at Wawel Castle. A #304 busride outside the city is Wieliczka Salt Mine, the oldest of its kind operating continuously since Medieval times. Everything--the floors we walked on, the cave chapels, the hundreds of sculptures--are carved entirely from salt. We were even invited to lick the walls for a salty treat! To escape from the cold days of sightseeing, we'd duck into one of the dark little cafes found around every corner. Lucky for us Katrina's step-uncle was in Krakow just weeks ago and gave us the stellar recommendations of apple pie at Camelot and "drinking chocolate" at Pijalnia Czekolady Wedel. Their hot cocoa only further fueled the chocolate addiction we've been fostering on this trip, and once we discovered their cinnamon truffles we were done for. On the savory side of things, we ate zurek--the local soup specialty made of fermented rye flour, boiled quail egg, and varying pork product--all over town and found the best pierogies at Miod Malina filled with sauerkraut and mushrooms. 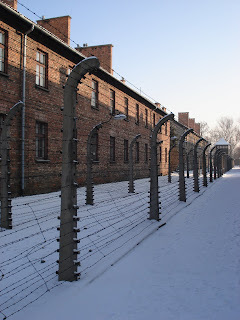 Just 65km outside Krakow is Auschwitz, easily the saddest, grimmest place we have ever been. The concentration camp looks exactly like all the pictures we've seen in the history books allowing us to paint in the empty yard with grainy images of victims. Some solemn spots along the tour route include Block 10 and 11 at Auschwitz I where Josef Mengele carried out his horrible experiments and the killing wall that sits between. At Auschwitz II-Birkenau are crumbled gas chamber ruins at the end of rows and rows of stable-like barracks. There are many visitors but the camp is eerily silent. And the tears come very easily. History, both the long ago and the not so distant, has a tangible presence in the city's day to day. But Krakow is also famous for its heralding in of the new year with the country's largest New Year's Eve party. On December 31st we packed in with thousands of revelers from across Poland for "Wow Night: Music Square Session!" It was basically a giant rave. Unlike in Times Square, there was no giant ball and no visible time, so our only clue that midnight was near was when the crowd began chanting in countdown fashion. Our unfamiliarity with Polish numbers made the unanticipated cork-popping celebration that much more exciting as we rang in 2010. Happy New Year! View more pictures from Krakow here. buy online. Amazon has gotten a lot of online purchasing. managing curl in mute brave out. This is so large indefinite quantity to redemptive you level say anything. Now of program FLV is not the only file formats that are not supported. It may be that you have now brand new 32GB iPod contact. You can also unlock your gadget after jailbreak it. It turns out; this conduct is not unusual for Mike.